You can recover up to $400 a month if you pick someone up to and from work everyday! We are a non-commercial social carpooling service that matches everyday drivers to commuters going along the same route. Car owners driving to their destinations can make their empty car seats available in exchange for a fee. Anyone with a car and valid driving license can sign up. It takes LESS than 5 minutes – right from your personal mobile device. You do NOT require any additional provisional license or commercial insurance. Signing up as a driver only takes 5 minutes – straight from your mobile phone on the Grab app! 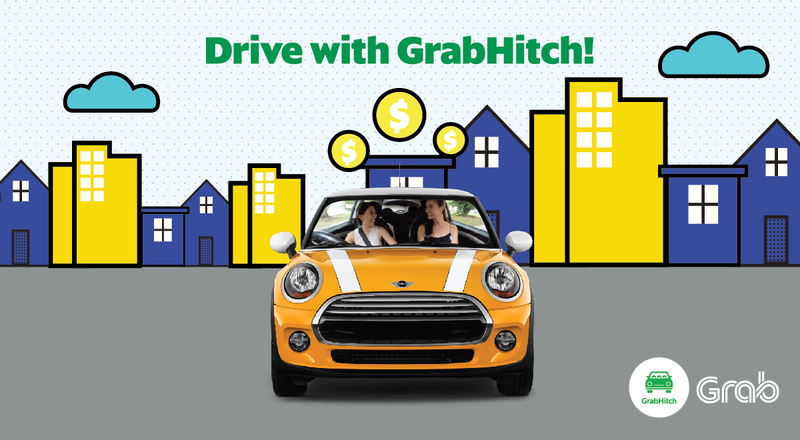 Use referral code ‘HITCHYOU‘ and get an additional $20 sign up bonus after you complete your first GrabHitch ride as a Hitch driver! Your application will be approved in 1-2 business days and you can start GrabHitch-ing! Recover up to $400 a month just by picking someone up to and from work daily! Pick up 8 passengers throughout the week and pay for about one full tank of petrol. Choose who to pick up and when to do so at your own convenience and schedule. Filter passengers by distance, time and even gender so you don’t have to go out of your way just to pick up/ drop off someone! The BIGGEST and fastest growing social carpooling community in Singapore. We have the largest pool of drivers and riders who believe in the cause of social carpooling. Do your part in reducing carbon emission and traffic congestion, while recovering your petrol costs and making new friends! Not forgetting, our additional driver perks. Receive exclusive merchandise, save on motor insurance, petrol, and many more! This incentive is only eligible for new drivers who sign up and successfully complete 1 Hitch ride as a driver between 8 December 2017 @ 00:00 hours – 31 January 2018 @ 23:59 hours. New drivers must sign up with the referral code HITCHYOU in order to qualify for the $20 credit incentive. The processing of the $20 credit into your GrabHitch driver wallet will only be conducted after the incentive period has ended (post-31 January 2018). Please allow up to 10 working days for the processing of the $20 into your GrabHitch driver wallet. Have questions? Email us at support.sg@grab.com with subject “HITCHYOU” and we will get back to you in 2-3 business days.